Liberty 1049. The Vapors. New Clear Days. 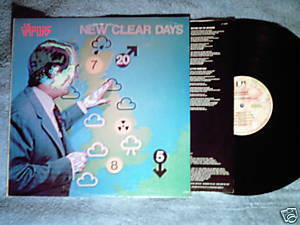 1980 LP includes Turning Japanese, Sixty Second Interval, Waiting for the Weekend, Spring Collection, Letter from Hiro. Band from Guildford, Surrey UK. Band members are David Fenton (songwriter, guitarist and vocalist), Howard Smith (drummer), Edward Bazalgette (lead guitarist) and Steve Smith (bass guitarist and vocals). Produced by Coppersmith Heaven. Vinyl is VG; cover with photos is VG with minor corner wear; inner sleeve with lyrics and stylized photo.